There appears to be a line of counties in blue, curving from Maine in the north-east to Mississippi in the south. 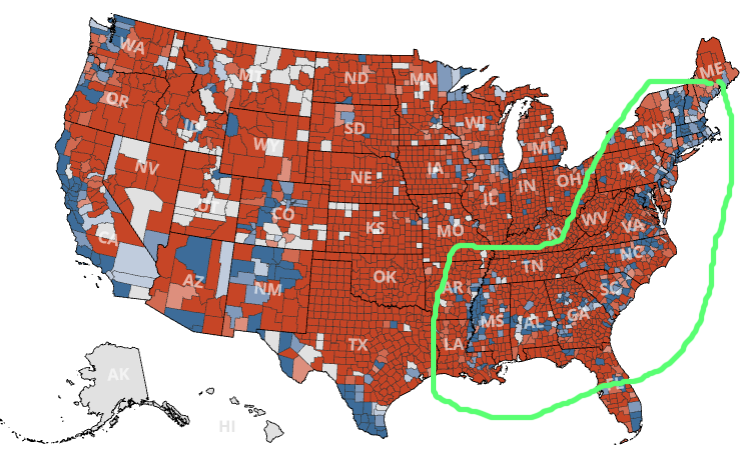 Those counties would have voted for the Democratic party, but they are massively surrounded by Republican counties. Is there something in common between them? As almost 80% of the African American voters voted for the Democratic Party, I think the correlation is both obvious and self-explanatory. What should be held in mind is that this map is rather crude, having the darkest colour say "48.9-86%". This could explain why the "Democratic line" is slimmer than this map may implicate. Together with population density, considering that urban areas tend to have a higher level of education and possibly better access to polls especially for African Americans that do not have much money (as registration and place of election are in foot-range and not miles and miles away), I would say there is a blend of effects, ethnicity being suprisingly strong in the indicated area. What first appeared to be a long unbroken line of counties from north to south actually seems to be made of two major parts. The blue counties north of Virginia are actually part of a larger area that also skirts the Great Lakes. The reasons why Northeastern United States votes Democrat (or used to) are complex and changing (it was mostly Republican before 1990), but it is unrelated to the rest of the curve. The emergence of the Northeast as a potential Democratic firewall has been a long time in the making. The steady realignment of the South toward the Republicans, which rendered the party increasingly conservative, called forth a counter-realignment among moderates in the North. The voting patterns of the Northeastern region would require an answer of its own, but it is related to population density, education, urban centers and social and cultural differences between the North and South. However, this answer mainly focuses on the Black Belt. There’s an arc of Democratic strength across the interior South. This is the old “Black Belt,” named for the fertile soil that gave rise to cotton plantations. These areas are still populated by a high percentage of African-Americans even 150 years after the end of slavery, and they’re predominantly Democratic today. The soil of the Southeastern regions is fertile and well-drained, making it ideal for cotton. The black population in this region today descends from the slaves that use to work the cotton fields. Over time this rich soil produced an amazingly productive agricultural region, especially for cotton. In 1859 alone a harvest of over 4,000 cotton bales was not uncommon within the belt. And yet, just tens of miles north or south this harvest was rare. Of course this level of cotton production required extensive labor. As Washington notes further in his autobiography, "The part of the country possessing this thick, dark, and naturally rich soil was, of course, the part of the South where the slaves were most profitable, and consequently they were taken there in the largest numbers. Later and especially since the war, the term seems to be used wholly in a political sense—that is, to designate the counties where the black people outnumber the white." I went back to previous elections and found that the "blue Black Belt" has been present in many of them. But the Black Belt has not always been visible on maps during elections. The Voting Rights Act, outlawing discriminatory voting practices, was passed in 1965. As result, a year earlier in the 1964 elections larger numbers of African Americans were excluded from the polls in Southern states. And, in turn, the blue band we see today was not visible. Before 1948, there was no clear distinction in party identification for African-Americans, although "at no point from 1936 on, according to Joint Center data, has the Republican candidate for president gotten more than 40 percent of the black vote." Today, however, some of our citizens are still denied equal opportunity for education, for jobs and economic advancement, and for the expression of their views at the polls. Most serious of all, some are denied equal protection under the laws. Whether discrimination is based on race, or creed, or color, or land of origin, it is utterly contrary to American ideals of democracy. This was followed by requests to Congress about, among other things, protecting the right to vote. 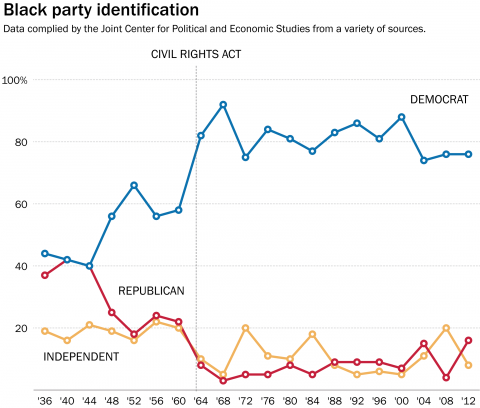 The second bump in 1964 was the Civil Rights Act by Democrat Lyndon B. Johnson. This Act would outlaw discrimination based on race and color and "ended unequal application of voter registration requirements". When he signed the bill, President Lyndon Johnson reportedly said that Democrats would, as a result, lose the South for a generation. It's been longer than that. The answer is likely complex in detail, but not nearly as complex on the surface as some are making it out to be. The way voter demographics have evolved in the US has led us to a point where the democrat/republican split is almost entirely* based on urban vs rural. * I always like to point out the one anomaly of very northern MN and WI being consistently blue. For no other reason that it's interesting to me. As others have noted, many of those counties are explained by having high concentrations of African-American voters. However, that does not explain the New England counties. Those have very few African-American voters but are overwhelmingly liberal, particularly Vermont and Massachusetts. New Jersey and New York City have significant African-American populations but not high percentages. Urbanization seems a better explanation there. Cotton is an even worse explanation, as some of the largest cotton areas are outside the relevant area and voted overwhelmingly Republican. Using cotton production as a proxy for African-American population seems unnecessary when we actually have direct numbers on the African-American population. 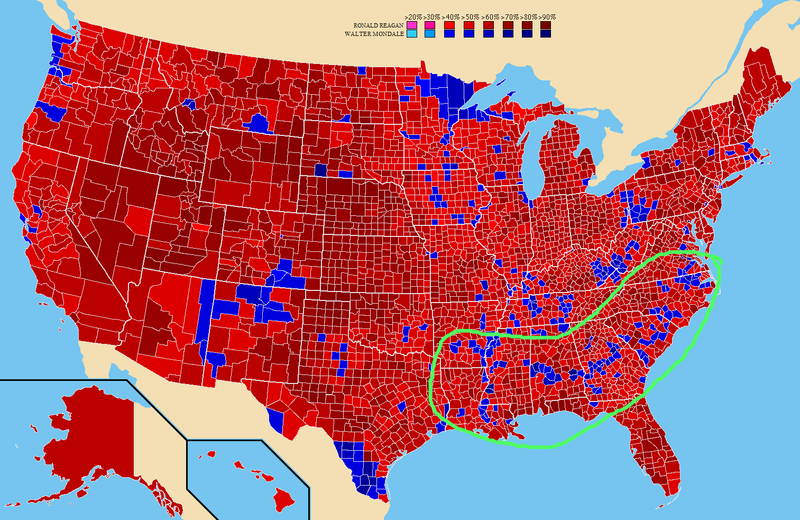 So the answer to your question is that no, that line of counties does not have anything in common other than voting Democrat. Smaller segments of the line may have more in common though. For example, most of the Southern portion of the line are rural areas with mostly African-American populations. And New England is New England. I suspect that the underlying answer is geographical. 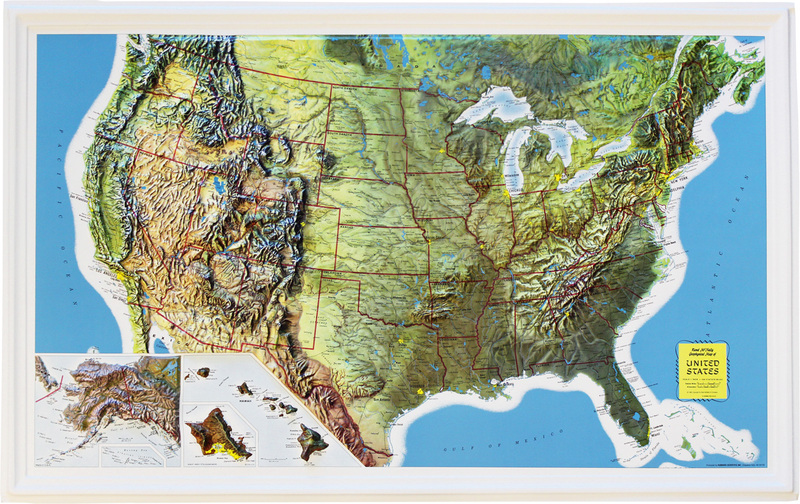 Looking at a relief map of the USA, the blue-voting line roughly seems to follow a line to the south and east of the Appalachian and Allegheny mountain ranges. The availability of agricultural land will have affected historical patterns of settlement, in turn affecting voting patterns. 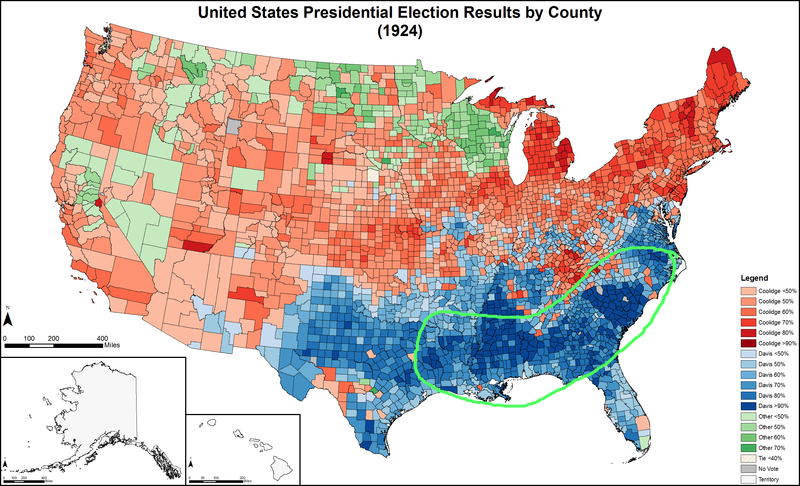 I don't know enough of American history to say what the story actually was for that area, but the voting map and the relief map seem too similar for it to be a coincidence. This is from 2007, but I suspect it'd be similar back when cotton was harvested by black slaves. But something else that stands out to me is that the band links together the state capitals of 6 of the 7 states it passes through in the southern part (MS, AL, SC, NC, VA, MD). 33 of the 49 state capitals to have come in are democratic right now, and in general quite heavily so (may well end up being a few more when all is counted, as most western capitals are surprisingly republican so far). Even in mostly republican states, they're some of the least red spots. To be honest, though, it's probably still quite a bit of a chicken-egg argument, because they are generally still population centers (most of the republican capitals are the tiny ones... only OKC, Topeka, and Phoenix are fairly large capitals going republican). But it's a trend I feel I've noticed through the years. Mike Scott's answer is close. Geology matters. Major cities in the United States (even in Republican-leaning states) tend to vote Democratic. As others have noted, this is partly because large cities tend to have large numbers of Democratic-leaning ethnic groups. It is also partly because large cities tend to have larger jurisdictions, with less local control over the quality of their schools and police. It's geology, which affects voting patterns more than you might think. In this particular case, your line was coastline about 100 million years ago, which has given it a geology that makes its soil especially fertile, so it was the favoured place to grow cotton, which means it was the favoured place to import slaves, whose descendants are still there and voting Democrat. See here for more details. Geology. Best to leave it as the 'fall line', as Mike Scott maintains. Not only did cargo transfer from water to road at this line, dramatically, this is where rivers fell, from the piedmont to the tidewater region. These are the water falls that provided power for industrialization in colonial America thru the civil war. Every river on this line has a small city and attendant road hub. 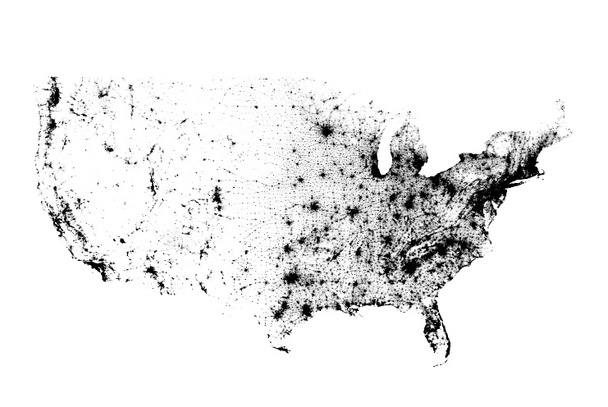 The roads, manufacturing, distribution centers, and population stayed. Pretty country. Not the answer you're looking for? Browse other questions tagged united-states election demographics or ask your own question. What do these regions, that voted for the Democratic party in the 2016 election, have in common? Who can, in the US, challenge the registration of a voter? Why doesn't the USA split into “Divided States of America” to achieve political autonomy?